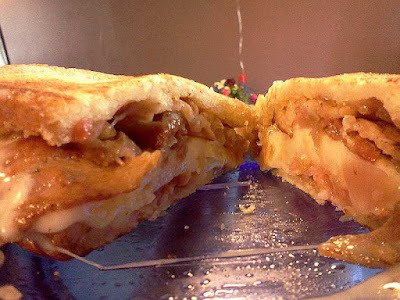 It could be the world's best grilled cheese. a combination or mixture of any great cheeses. I recommend Gruyere, Havarti, Irish cheddar, etc. Fry bacon, and onions together. Shred cheeses, and butter bread slices. Fry over medium heat sprinkling garlic salt to taste. Of course there's many variations. I may try adding some fried mushrooms in the future and I've already tried the above "fancy" grilled cheese with fried cheese, similar to this. French (or European style) butter, good cheese, a bit of bacon and you can't go wrong. A gourmet grilled cheese is only minutes away from becoming a life-long addiction.